When we read a book, it’s a linear process. We start at the beginning. Then reading one word at a time, we make our way to the end. Once we reach the last word, the final period, we’re finished. Usually we put the book down and move to another one. If it’s a really good book, we may read it again. Or we may loop back to investigate certain sections to look for something we might have missed or seek clarity from a confusing passage. This applies to both fiction and nonfiction, though in different ways. Too many people read the Bible like every other book. Starting at the beginning and reading one word at a time, they make their way toward the end. But few ever arrive. They get mired down in how the Bible is put together, because it’s not like any other book. From a reading experience, a book is one-dimensional. It’s a straight line, with only length, going from start to finish. There is no width or depth, just length. To read the Bible rightly, we need to get beyond our linear mindset. We need to think of the Bible as also having width and depth. Let’s consider it as three-dimensional and not one-dimensional with only length, which results from stringing words together. 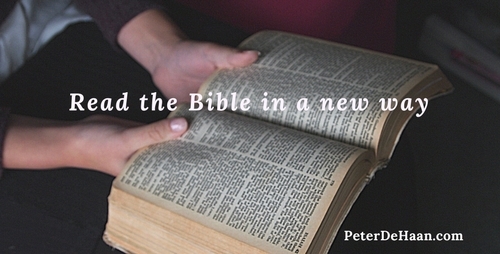 To move beyond one dimension requires we read the Bible differently. Yes, we can still look at one passage or story, read it linearly from start to finish, and enjoy the journey. But there’s more. We can loop back and jump forward. We can consider parallel passages—and the Bible has many. We can use one passage to better understand another. When we consider the Bible as three-dimensional, we can do word studies, look for reoccurring themes, and use scripture to interpret scripture. When we do so we begin to mine the riches of the Bible, no longer as a one-dimensional, linear book, but as a multi-dimensional experience that takes us to an unlimited number of destinations. Let’s jump to the middle and consider the book of John. With dramatic poetic flair, John tells us that Jesus, the whole point of the Bible, didn’t just show up for the Gospels as a baby in a manger. He was there at the beginning. He took part in creation. And he is there at the end. As we migrate from our present reality to the next, Jesus is there to guide us. The book of Revelations hints at this and the last two chapters confirm it. And a careful reading of the Old Testament sees hints of Jesus sprinkled throughout. Jesus is everywhere, not limited by time or space. It’s hard to grasp the Bible as four dimensional, not being bound by time. However, God—who created us, reveals himself to us in the Bible, and serves as our reason for being—is not bound by time. He exists outside our time-space continuum. For when he created the three-dimensional reality in which we live, he also made time as a fourth dimension in which we move forward. But he is constricted by neither space or time. He lives outside it, while we live in it. The Bible contains words and ideas and truth which have length and width and depth. The Bible also transcends time. It’s four dimensional. Though I will spend the rest of my life trying to grasp this concept, it’s a reality I except and embrace. May we all begin to read the Bible in this new way.